Want to listen to my voice for 6 minutes? You’re in luck! 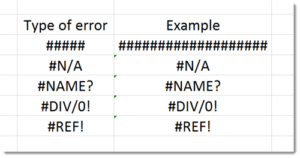 If you’d also like to learn about a handful of common excel errors you’ve truly lucked out! At atom we rely on MS Excel to do analysis on the fly and to store large quantities of data. Whatever you’re up to, an error message can often be frustrating enough to stop you in your tracks preventing you from getting to that juicy data. We’ve broken down some of the most common problems in a video here. #### errors are when the result of a formula is too big to display. It’s often related to cell formatting so try a few different formats. #N/A is when part of the formula is not available. There’s an error with a part or all of the formula. Break the formula down to find out which bit excel can’t return. #NAME? is related to incorrect text. It’s likely that a part of the formula is spelt wrong. Or it may be a named range that’s spelt wrong. #DIV/0! the formula is dividing by zero. Break the formula apart to find out which part is zero and try to correct so this can’t happen again. The IFERROR formula could help. #REF! means a reference has been moved or deleted so is no longer available. This often happens when cells are deleted or pivot tables are changed. We quite enjoy excel related things, so if you have any frustrations or feel like you’d like to learn more about something please let us know. You can email the excel guru team at excel@atom42.co.uk. This sheet has details on the topics we’ve covered so far.